The In Print Book Fair will feature more than thirty authors and five special guests speaking throughout the day. 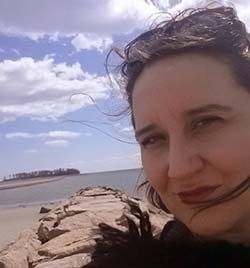 Abbie Reese is an independent scholar and interdisciplinary artist, and the author of Dedicated to God: An Oral History of Cloistered Nuns. Granted rare and continued access for more than eight years to one of the strictest religious orders in existence, the book focuses on a Poor Clare Colettine order of cloistered contemplative nuns at the Corpus Christi Monastery in Rockford, IL. The nuns make vows of poverty, chastity, obedience, and enclosure. They observe monastic silence and seek anonymity. In Abbie’s relationship- and research-based artistic practice, she utilizes a hybrid of oral history, documentary, and ethnographic methodologies to explore individual and cultural identity – the construction of new identities and the performance of social roles – in primary oral cultures and enclosed communities. Her oral history and photography exhibit, Erased from the Landscape: The Hidden Lives of Cloistered Nuns, has been shown in galleries and museums and she has presented her work at academic conferences internationally. Abbie Reese will be the featured speaker at 11:00 am. The In Print Book Fair is on Saturday, October 25th at the Mendelssohn Performing Arts Center in Rockford, Illinois. The book fair begins at 11:00 and runs until 4:00. Everyone is invited to attend!